There has been a huge surge in the trend of growing your own food and it is a great thing to get involved with. Not only is it a fun and rewarding experience it can save you money and give you more nutritious food. You don’t need a lot of space or equipment to get started and it certainly beats paying supermarkets a lot of money to provide your vegetables. You don’t need to have a huge garden to grow your own food. In fact you can start out with a few pots in your kitchen. If you have a balcony then set up containers or growbags. Ideally you would have a vegetable patch but if you haven’t got space then think about getting an allotment. You can rent one from your local authority quite cheaply and then you can really get into the swing of it. There are so many different types of food that you can grow. Start out with some herbs in your kitchen which you can buy from the supermarket. Tomato plants or small fruit bushes are good for balconies. If you have a vegetable patch then you can grow almost anything. Look on the back of seed packets to find out when you should plant each variety and when it will be time to dig them up. Growing your own vegetables is a lot cheaper than buying them in the supermarket. Whether it is herbs, tomato plants or bigger things like potatoes and green beans. You will need to buy some good compost or grow bags and the seeds that you want to grow. Other than this all you really need is something to water them with and perhaps some plant food. 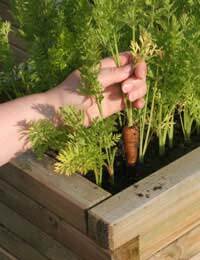 As you get more involved in the process you may want to buy some canes to help guide the plants and some garden tools to turn the soil. There has been a lot of talk about organic food in recent years. This is food that hasn’t been with any chemicals and pesticides and is grown naturally. As this food is considered better for you will pay a premium for buying it in the supermarket. The good thing about growing your on food is that it is already organic and yet much, much cheaper than even just buying regular fruit and vegetables. It is also a great way to get your kids involved in food and help them to understand about eating healthily. With food prices at an all time high, any way to cut your outgoings is good. Growing your own food is a great way to eat healthily and save money. It is very easy to get started and you can even grow herbs in your kitchen. It doesn’t cost much and if you have a vegetable patch or get an allotment then you can pick and choose which fruit and vegetables you would like to grow. As well as been cheaper your home grown food will also be better for you and ones that have been covered in chemicals and pesticides.